This summer, Louis Lhomel (NS Bikes), Parappa (NS Bikes) & Matt Macduff (Octane One) went on one of the most out of control trips they’ve been on in years! The goal was to explore key major cities in the province of Quebec other than Montreal. With a tight schedule (5 days) and variable weather, they chose to head up to the old and beautiful Quebec City and one of the best street riding cities they’ve hit yet, Sherbrooke. Eventhough Quebec City had truly amazing street spots, it was flooded with security guards everywhere and made it really hard to film, so the boys didn’t stick there too long. On the road to Sherbrooke, they stumbled upon an abandoned quarry and couldn’t resist sending a couple gainers into it! Once they got to Sherbrooke everything just set into place; crazy street spots, no security guards and the best guide/best person ever, Pierre-Marc Tremblay! 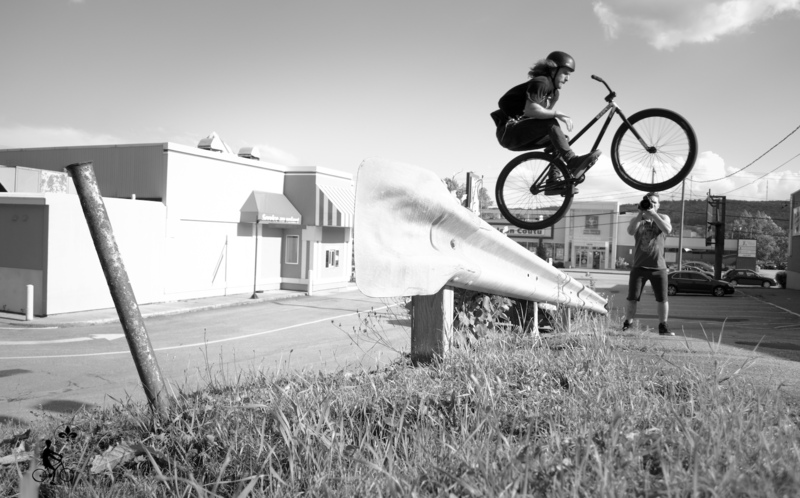 The boys were so stoked they called up Sam Croteau (NS Bikes) & Kent Woods (NS Bikes) to show up and shred for a day or two! All in all, the trip’s unforgettable vibe represents the true friendship here at LamaCycles. We hope this video gives you the urge to trip around with your best friends in the winter and next summer to discover new destinations, great locals and build lifetime friendships! Enjoy! Louis scopping out the high ledge for some nose manual action. First try didn’t go as planned. 360 tuck no-hander in the bank for Parappa. Fast and stylish wallride to euro for Louis. Louis’ latest trick invention, “La Boulette”! Parappa not sure if this very tight wallride is possible. Parappa doesn’t seem to have a problem getting in tight stuff!